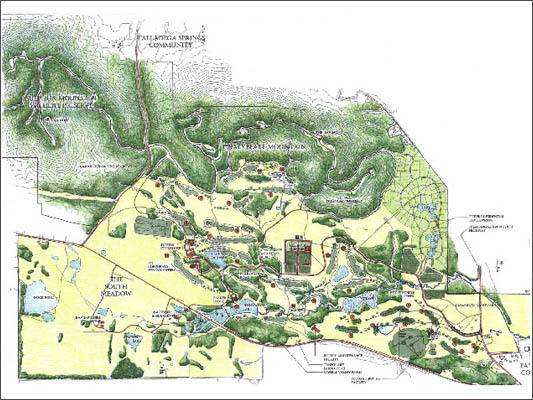 This master plan for Pursell Technologies was designed to take full advantage of a natural setting. The 3,100 acre property serves as the new home for the company’s corporate headquarters. Clients enjoy fishing, hunting, golfing, and a new guest lodge in a setting that has been carefully planned to showcase the property’s natural beauty. Our role as landscape architects was to select placement for the corporate facility, guest lodge, club house, golf course, and roadway layout. In addition, limited residential development areas, horse paddocks, sports fields and product test facilities were incorporated into the design. We worked closely with the building architect and golf course designer throughout the project to insure the existing views and landscape features took precedence over new development. Our close relationship with the client continues today as additional phases of the master plan are implemented.